One of the challenges of women’s history is that women have left behind fewer written records than men. 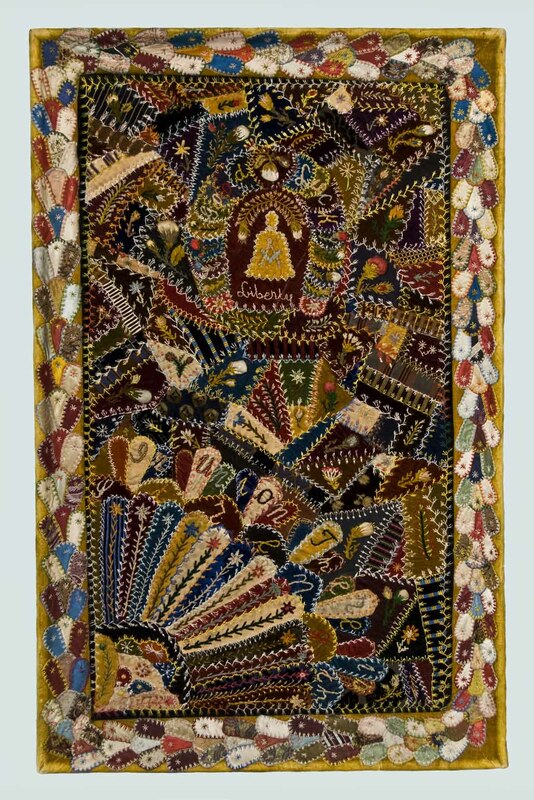 This imbalance makes women-made folk art particularly valuable as historical evidence. As folklorist Henry Glassie elegantly put it: “Few people write. Everyone makes things. An exceptional minority has created the written record. The landscape is the product of the divine average.” Painstakingly created and lovingly used, quilts especially can help us better understand the lives of ordinary Montana women. Minnie Fligelman’s crazy quilt is one example of how a quilt can offer insights into both local history and national trends. According to her daughters, Frieda Fligelman and Belle Fligelman Winestine, who donated this quilt to the Montana Historical Society in 1949, Minnie Fligelman used samples from her husband Herman’s merchandise cart to make this crazy quilt. 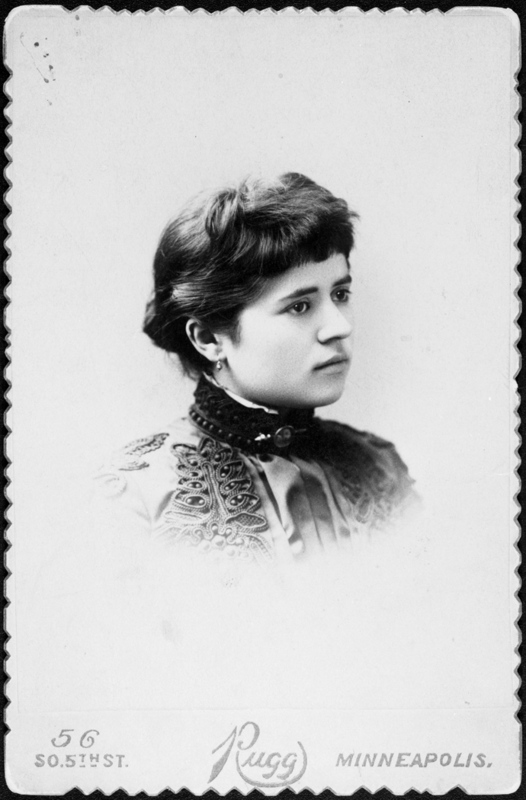 Minnie Weinzweig and Herman Fligelman, both Romanian Jews, married in Minnesota in 1888 or 1889. In 1889 they moved to Helena, where Herman ran the New York Dry Goods Company. Because Minnie died while giving birth to Belle in 1891, this quilt must have been an important memento of a woman the girls never got to know. Herman Fligelman was a prominent Helena merchant, who sold “honest goods for honest prices.” Lovingly preserved by her daughters, Minnie’s quilt gives us a peek at the velvets and silks that Herman’s store carried. That such lush fabrics were popular in Helena reflects the town’s mineral wealth—and the buying power of the Fligelmans’ customers. 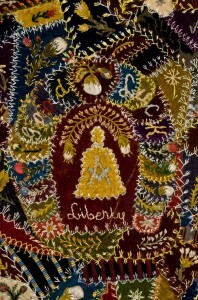 Detail of Minnie Fligelman’s “Crazy” quilt. Photo courtesy MHS X1949.04.01. Minnie Fligelman’s choice of quilt patterns also reveals larger historical trends. Pieced and appliquéd block quilts were the norm around the time of the Civil War, but in the 1870s American quilters suddenly broke away from the dictates of block symmetry. So-called crazy quilts became ubiquitous in the Victorian era. 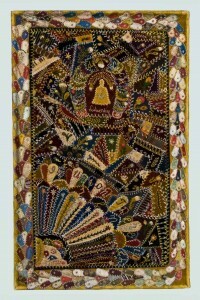 These quilts were usually made of silks, satins, and velvets, and characterized by elaborate embroidery and adornment. Many quilt historians trace their popularity to the 1876 International Exhibition in Philadelphia. The Japanese pavilion at the exhibition drew massive crowds and sparked an American fascination with asymmetrical art. 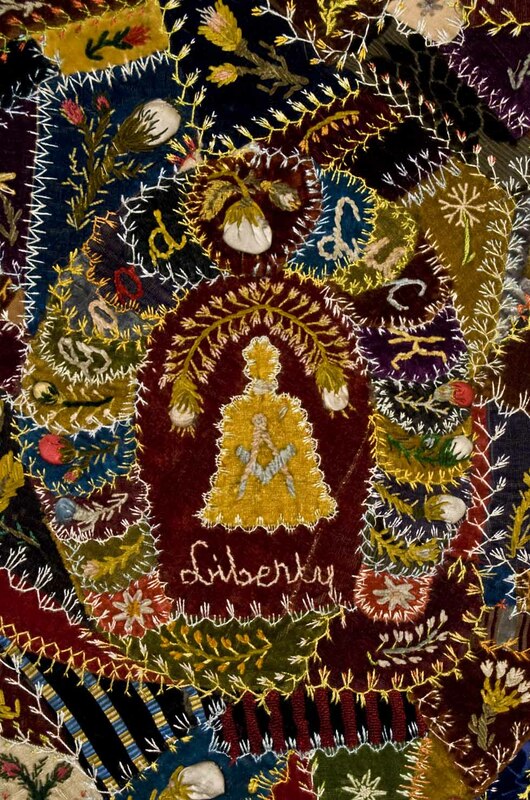 Often used as decorative throws rather than bedding, these frenetic-looking quilts were in fact carefully planned and executed and painstakingly embroidered to display the maker’s fine needlework. Portrait of Minnie Fligelman, 1889. Photo courtesy MHS PAc 87-103. Learn more by reading Annie Hanshew’s book, Border to Border: Quilts and Quiltmakers of Montana (Helena: Montana Historical Society Press, 2009) or Mary Murphy’s article, “Montana Quilts and Quiltmakers: A History of Work and Beauty” in Montana The Magazine of Western History 58, no. 3 (Autumn 2008), 23-25, 33-47, 94-95. Abrahams, Ethel Ewert, and Rachel K. Pannabecker. “‘Better Choose Me’: Addictions to Tobacco, Collecting, and Quilting, 1880-1920.” Uncoverings, 2000. Berlo, Janet Catherine, and Patricia Cox Crews. Wild by Design: Two Hundred Years of Innovation and Artistry in American Quilts. Seattle: University of Washington Press, 2003. Glassie, Henry. “Meaningful Things and Appropriate Myths: The Artifact’s Place in American Studies.” In Material Life in America, 1600–1860. Edited by Robert Blair St. George. Boston: Northeastern University Press, 1998. Hanshew, Annie. Border to Border: Historic Quilts and Quiltmakers of Montana. Helena: Montana Historical Society Press, 2009. ______. “From Sunburst to Nine-Patch: Treasures of the Nineteenth Century.” Montana The Magazine of Western History 58, no. 3 (Autumn 2008), 25-32, 94. Hedges, Elaine. Hearts and Hands: Women, Quilts, and American Society. Nashville: Rutledge Hill Press, 1987, repr. 1996. ________. “Quilts and Women’s Culture.” The Radical Teacher, no. 4 (March 1977), 7-10. Hornback, Nancy. Kansas Quilts and Quilters. Lawrence: University of Kansas Press, 1993. Kenney, Alice P. “Women, History, and the Museum.” The History Teacher 7, no. 4 (August 1974), 511-23. McCarter, Sue Barker. “Crazy Quilts: Quiet Protest.” In Ruth Haislip Roberson, ed., North Carolina Quilts. Chapel Hill: University of North Carolina Press, 1988. Murphy, Mary. Montana The Magazine of Western History 58, no. 3 (Autumn 2008), 23-25, 33-47, 94-95. Phillips, Brenda. “Women’s Studies in the Core Curriculum: Using Women’s Textile Work to Teach Women’s Studies and Feminist Theory.” Feminist Teacher 9, no. 2 (Fall/Winter 1995, 89-92. Woodward Thomas K., and Blanche Greenstein. Twentieth Century Quilts, 1900-1950. New York: E. P. Dutton, 1988. I treasure the book “Border to Border: Quilts and Quiltmakers of Montana (Helena: Montana Historical Society Press, 2009)” and highly recommend it to all the western quilters I know! Great stories and beautiful pictures!